Epic Games is extremely close to releasing its first game for the iPhone, iPad, and iPod Touch. 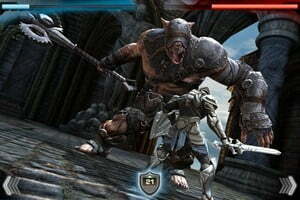 The previously dubbed “Project Sword,” now has an official title – Infinity Blade – and some screenshots of the game have been released for a little more detail. It’s an action, medieval-set RPG (no big surprises there), in which you engage in 3D sword fights. If you want some first-hand experience before the official release, you can explore it in the free app, Epic Citadel. This is the first game for mobile devices released by the enormously popular Gears of War developer — and specifically for Apple iOS users. So if you don’t use an Apple device, looks like you’re out of luck for the initial launch of the game. On the plus side, there will be a multi-player option available from Apple’s Game Center. There’s no price or release date yet, but it’s safe to assume the swiftly-approaching holiday season will see its introduction to the App Store.